Bulk Reef Supply Reverse Osmosis Deionization Systems only take a few minutes to have connected and making purified water. All of the plumbing on the RO/DI unit will be complete and all you will need to do is connect the tubing to a suitable source water connection, and direct the product and waste water lines. 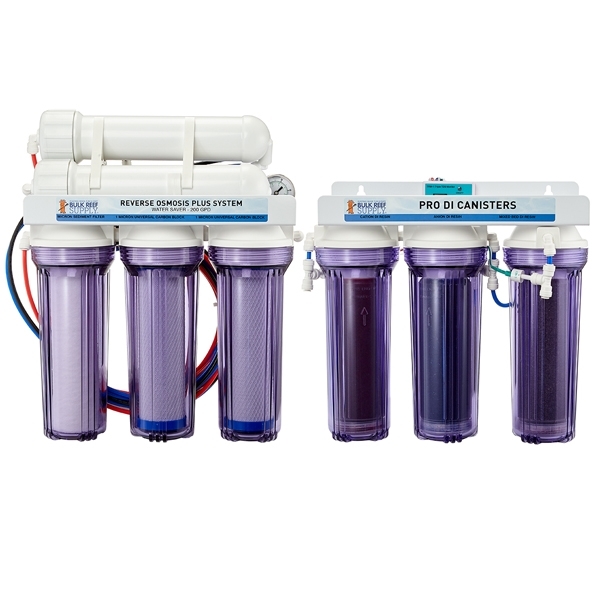 BRS 7 Stage RO/DI systems have 1 sediment filter, 2 carbon blocks, 1 membrane, and 3 deionization stages making them perfect for well water, and virtually all types of city water that is treated with chlorine or chloramines that uses a high amount of DI resin. Unpackage the RODI system and select the source water adapter of your choice and with your home's water turned OFF, install the source water adapter to a cold water line. Connecting any reverse osmosis system to a hot water line may cause irreversible damage to the membrane. Attach the Red line to the source water connection adapter. Connect the Blue product water tubing that is attached to the RO systems body to the Triple DI canisters input fitting. Direct the Blue product water line to a suitable water storage/collection container. This is the water that you will want to use in your aquarium. Connect/Direct the Black waste water line to a drain. Waste water is considered a brine solution that should not be used in aquariums. The brine will be extremely hard, and high in TDS. When all three connections are made, slowly turn on the source water supply and allow the system to run for one hour discarding any water produced through the Black or Blue lines. While the system is priming it is a good time to check for leaks from any fittings or connection points. Your Bulk Reef Supply RO/DI System is now ready for use.